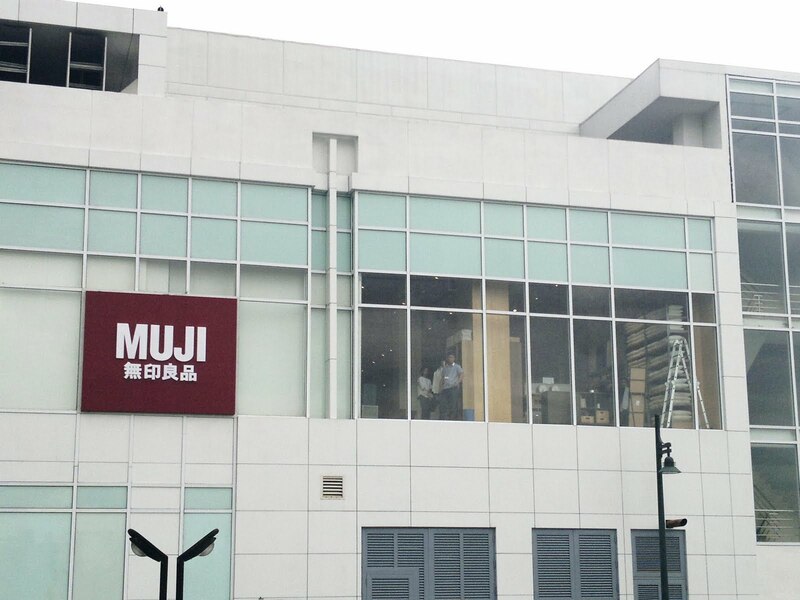 The Japanese retail company MUJI has finally arrived in Manila and has opened its doors to public since October 16, 2010. It's located on top of Gap at Bonifacio High Street, just before the street crossing to Serendra. 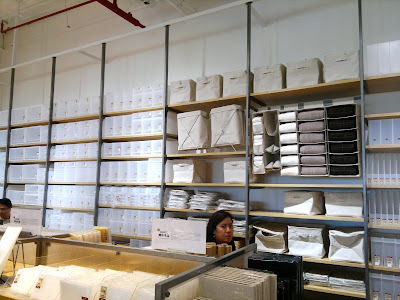 If MUJI is new to your ears, I suggest you visit them personally to see why people love their items. 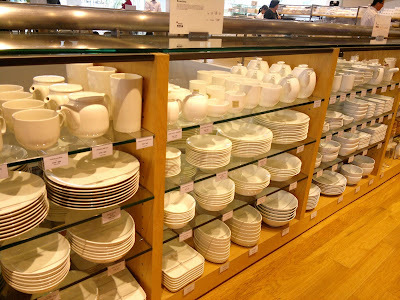 Generally, the store sells a wide variety of household items that are distinguished by its design minimalism and emphasis on recycling. You will notice that the items do not sport any Muji logo and their packaging are plain and simple. I first heard of the store back in 2008 when I was in Hong Kong. Now that it's here, it has taken Manila by storm, as evidenced by long lines at the cashier and items running out of stock. 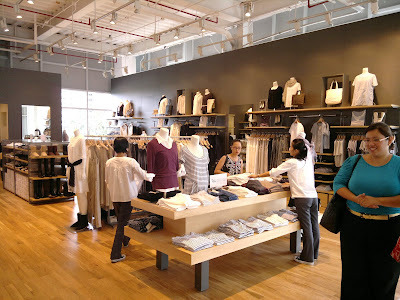 Pictures below show apparels priced around Php1,150 each and shoes priced at Php1,650 and above. 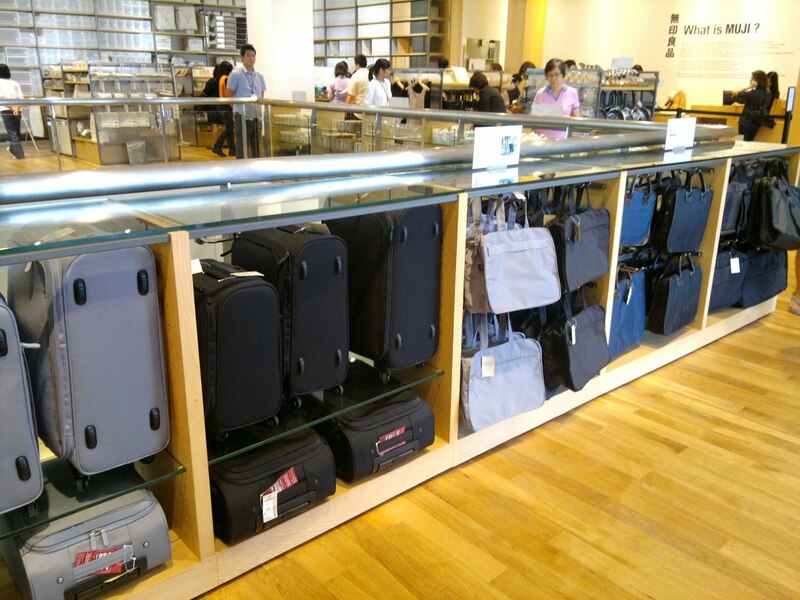 They also have luggage bags (from Php2,000++ to Php5,000++) and tons of organizer pouches for clothes, undergarments, toiletries, etcetera (from Php350++ to 550++). 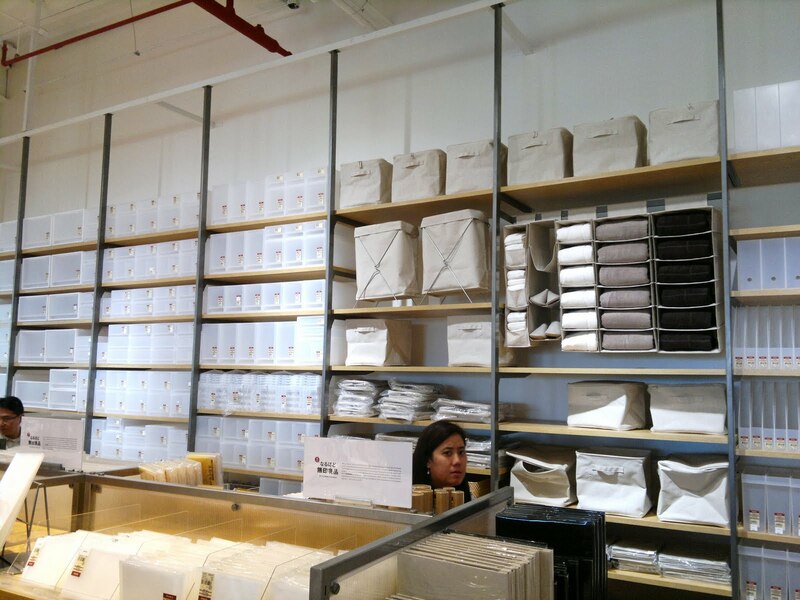 You can also see a wall space full of storage bins and boxes for whatever things you need to keep away to make your house look cleaner and more organized. 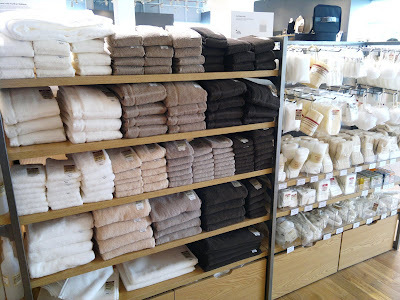 There are also small and big towels, different kinds of luffa, and stuff for the comfort rooms. What's a household store without the household items like ceramic plates, mugs, coffee and sugar containers, kitchen appliances, and many more! 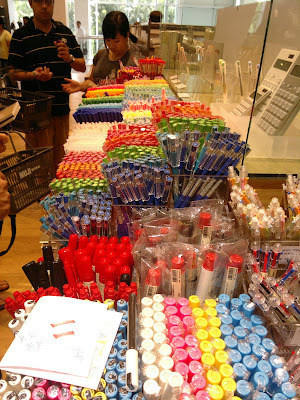 And our favorite... notebooks, pens, markers, highlighters, pens, pens, and different colored pens! 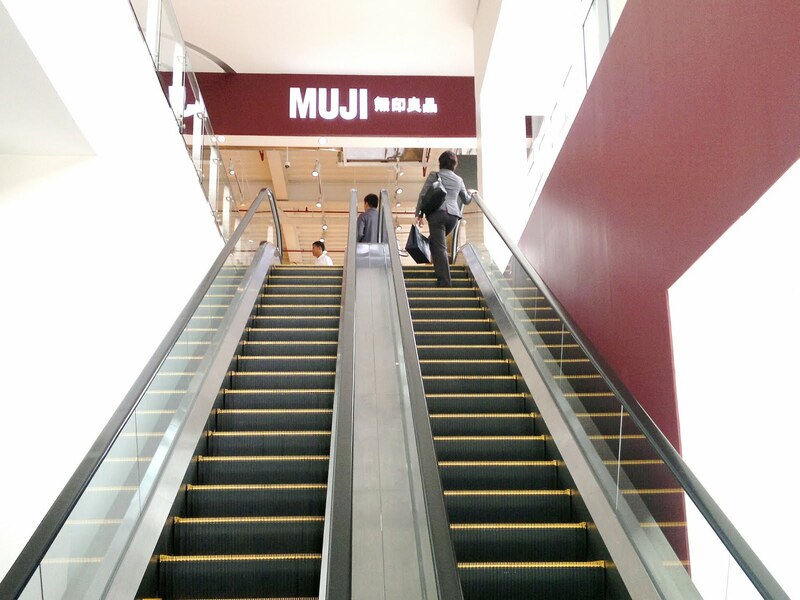 They also have a few food items there that you can check out. I was just sneaking to take pictures, so I kinda missed that part. Price is cheaper here if compared to the United States', but might be a little bit expensive or almost the same price when compared to Hong Kong's. I'm not sure though on this one. If you've got info, please let us know. Some of their items can be tempting, but make sure you need them before purchasing. Spend wisely or your wallet might cry for help afterwards. P.S. All photos above were taken using the Nokia N8. I didn't see the food section! I didn't see the food section when I went there! Wahhhh! I can't believe those were taken with a phone camera. That's really evil of you. =P It makes me want to buy the Nokia N8. LOL.